This morning TSAC put another shipment in the U.S. Mail to Afghanistan! TSAC is counting down the days "Until They All Come Home" and we complete our mission. Until then we intend to continue to support American forces deployed to combat zones. The TSAC shipment today was just over 202 pounds and was split between three military units. 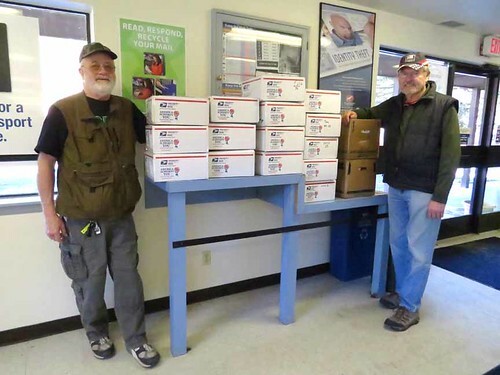 Here is a photo with BGR and RailBuff ready to cart the 17 boxes into the Post Office in Bailey. We have a Marine Recon team located in a primitive Forward Operating Base (FOB) tasked to train Afghan Local Police (ALP) and engage local Taliban insurgents. Additionally, TSAC supports a U.S. Army unit (Engineers) whose mission is to locate and disable Improvised Explosive Devices (IEDs). They are based at Camp Leatherneck, a large base home to many diverse operational units. TSAC's third adopted group is a U.S. Air Force unit at Camp Bastion (adjoining Leatherneck) with the responsibility of arranging transportation for wounded soldiers being sent to Germany or home to the U.S. for further treatment. All of the snack and comfort items contained in these boxes comes to TSAC through the generosity of our mountain community. Funds to pay postage costs come from cash donations from this same community. TSAC is facing a Postal rate increase in late January. TSAC is a (IRS) Small Charity under 501(c)(3) of the tax code and donations are tax deductible. TSAC has no "overhead" operating costs. No members are compensated and our storage locker is donated by Bailey residents Bea and John Everest. Checks may be payable to: TSAC and mailed to TSAC, P.O.Box 1033, Bailey, CO, 80421-1033. If you have donated goods at our periodic collections in front of King Soopers - THANK YOU! TSAC maintains collection boxes in front of King Soopers and Safeway in Aspen Park and Conifer. Please feel free to drop items in these boxes. We will take care of getting them off to our troops in Afghanistan. Thanks again for caring for the troops and helping TSAC with it's mission!